East Asian technocrats and modernists in Beijing, among others, are eagerly embracing an updated Confucianism -- even as scholars in the West ask some eyebrow-raising questions. Did the Chinese sage really exist? If so, did he have much to do with the religious and ethical system that bears his name? Could Confucianism have been invented by Jesuit missionaries? TO many educated Westerners, Confucius is the very emblem of Chinese civilization and religious belief. If the dates that historians have assigned to him -- 551-479 B.C. -- are correct, he was a contemporary of the Greek poet Pindar, the tragedian Aeschylus, and the philosopher Heraclitus. According to tradition, Confucius was easily their equal. In addition to having written or edited parts of a diverse body of literature that includes the (Book of Changes) and the Book of Poems, classics to this day, he was a scholar, a minister of state, and an accomplished horseman and archer. Confucius is said to have taught his disciples the cultivation of personal virtue (ren, usually translated as "goodness" or "humaneness"), veneration of one's parents, love of learning, loyalty to one's superiors, kindness to one's subordinates, and a high regard for all of the customs, institutions, and rituals that make for civility. So appealing is Confucius that his Lunyu, or Analects, a collection of 497 sayings and short dialogues written down by his disciples after his death, has been translated again and again, especially during this century. Ezra Pound tried his hand at the manuscript; Arthur Waley published a famous English translation in 1938; and two years ago Simon Leys (the pen name of the Australian Sinologist Pierre Ryckmans) translated it into strikingly spare and elegant English prose. One reason Confucius has resonated with twentieth-century intellectuals is that his religiosity -- or lack thereof -- is remarkably congruent with our time. He appeared to encourage obedience to the will of "heaven" and reverent observance of religious rites -- the ancient Chinese practice of offering sacrifices to the spirits of one's ancestors, for example -- while remaining agnostic on the question of whether a supernatural world actually exists. One of the analects declares (in Leys's translation), "The Master never talked of: miracles; violence; disorders; spirits." The Analects contains a version of the Golden Rule ("I would not want to do to others what I do not want them to do to me"), but Confucius' real concern seems to have been the Golden Mean: all things in moderation, even moderation itself. According to another of the analects, "Lord Ji Wen thought thrice before acting. Hearing this, the Master said: 'Twice is enough.'" Such anecdotes prompted the novelist Elias Canetti to observe, "The Analects of Confucius are the oldest complete intellectual and spiritual portrait of a man. It strikes one as a modern book." In short, ever since the Enlightenment, Confucius has been widely regarded in the West as a Chinese personification of humane, tolerant, and universal ethical principles. In his Age of Reason, Thomas Paine listed Confucius with Jesus and the Greek philosophers as the world's great moral teachers. A figure of Confucius in flowing sleeves joins Moses, Hammurabi, and Solon among the lawgivers in the marble frieze encircling the Supreme Court's hearing room in Washington, D.C. But what if this familiar image is completely untrue? The answer to this question is of more than academic significance. The portrait of Confucius as the leading Chinese sage, together with the traditional holistic and moralistic reading of the Analects that Leys's translation exemplifies, has an important ideological constituency: intellectuals of the Chinese diaspora and their Western admirers, who have used Confucianism to assert a non-Maoist but thoroughly Chinese identity. For several decades these self-described New Confucians -- a group consisting mostly of university professors -- have been promoting "Confucian values" as the driving force of the non-Communist Chinese cultures of East Asia. Behind the recent economic boom in Taiwan, Hong Kong, Singapore, and elsewhere, they contend, lay a "Confucian ethic" of respect for family, hard work, and the social order equivalent to the Protestant ethic that Max Weber postulated as being responsible for the rise of capitalism in Northern Europe. The New Confucians have been promoting an updated Confucianism -- minus such atavistic features as the ancestor cult and an offhand attitude toward women -- as the underpinnings of both the human-rights movement in China and a communitarian version of modernity that affords individual liberty without encouraging the libertine excesses that, as they see it, plague America and Europe. If the New Confucians are wrong about Confucius -- if, that is, he never was the humane sage and ethicist of popular imagination, and Confucianism as commonly perceived is largely a mythical concoction -- their theories and platform would suddenly rest on a shakier base. THAT is precisely the premise of a new strain of Confucian scholarship that has stirred excitement and controversy. The scholarship takes on traditional understandings of Confucianism in two ways: by questioning its origins and by questioning its Chineseness. The first issue has been powerfully addressed by E. Bruce Brooks, a research professor of Chinese at the University of Massachusetts at Amherst, and A. Taeko Brooks, his wife and co-researcher. They argue that the "historical" Confucius, far from being a scholar, was a warrior of noble birth but slender means who had the misfortune to live at a time -- toward the end of the Zhou dynasty (c. 1123-221 B.C. ), which saw the collapse of feudalism and the rise of mass-conscripted armies -- when his skills as a charioteer and bowman were becoming obsolete. Although he was not a teacher in any formal sense, his forceful personality attracted followers among younger warriors, the Brookses hypothesize. The Brookses hold that only sixteen of the sayings attributed to Confucius in the Analects actually came from his mouth, and that only a few more came from his direct protégés. Today's image of Confucius as a learned man, they maintain, did not start to emerge until after his death, when groups of his disciples organized themselves into formal schools for the purpose of perpetuating his ethos. In the Brookses' view, Confucius, whose ipsissima verba they claim to have isolated in a portion of Chapter 4 of the Analects, probably had a bit of education as a member of the nobility, but he did not write any of the other classical texts attributed to him. The Brookses believe that those texts were not even in final form until the fourth century B.C. Nor did Confucius concern himself with many of the values conventionally attributed to him, according to the Brookses. When he spoke of ren (or rvn, as they spell it in the idiosyncratic romanization system that Bruce Brooks invented in an attempt to transcribe Mandarin Chinese phonetically), he probably was referring not to the cultivation of moral virtue but to loyalty to one's comrades and other traits desirable in a gentleman soldier. Only in later layers of tradition, the Brookses say, was Confucius "civilianized'' -- turned into a savant and high minister -- and made an expounder of "the systematic structures of Imperial philosophies." As Bruce Brooks told me recently, "His disciples and successors more or less hived off into their own movements. They all had a nominal connection with Confucius, and they were all trying to define the culture in the Warring States period" -- a turbulent two centuries during which feudal lords battled one another incessantly in the absence of a strong central government. The Brookses' arguments are laid out in their book (1998). The second big issue -- the Chineseness of Confucianism -- is the focus of Lionel M. Jensen, an associate professor of history and the director of Chinese studies at the University of Colorado at Denver. Jensen contends that there was no such thing as Confucianism until Jesuit missionaries entered China in the late sixteenth century. Until their arrival there were merely the spiritual and ethical traditions of the ru, China's elite scholarly class, who, thanks to the off-and-on patronage of emperors over the years, enjoyed a monopoly on education and on the staffing of bureaucratic posts, by means of the civil-service examinations they administered. The ru claimed to be carrying on the tradition of Confucius, and he certainly enjoyed pride of place in their veneration as the leading propagator of ru values. However, as Jensen points out in his book (1997), the Analects was only one of several literary classics esteemed and taught by the ru (the others are attributed to Mencius and other early ru teachers). Using the model of Christian theology, which centers on the person of Jesus Christ, the Jesuits recast the ru tradition as a full-fledged religion centered on the person of its supposed founder, Confucius, who they believed had providentially stumbled across monotheism (in his references to "heaven") and Christian morality (in his version of the Golden Rule). Jensen says that in exalting Confucius, the Jesuits tended to ignore any Chinese philosophical writings other than the Analects, and they did not value China's other, far more widely practiced religious traditions, including Buddhism, Taoism, and the omnipresent folk cults of gods and ghosts. The missionaries promoted their Christianized version of ru doctrine to the West when they returned home. And then, Jensen theorizes, it was only a matter of time before the Enlightenment philosophes adopted Confucius, savoring his apparent reasonableness and his skepticism about the supernatural. The philosophes in turn created and popularized the image of Confucius that persists among Westerners to this day, and in the process spread the misapprehension that Confucianism is the baseline religion of China in the way that Roman Catholicism is the baseline religion of Spain. In fact, almost no one practices Confucianism in China today, and even in premodern times only scholars, bureaucrats, and occasionally emperors followed the ru tradition. If China can be said to have a baseline religion, it is a mixture of popular Taoism and folk beliefs. 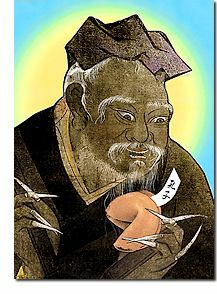 According to Jensen, the Jesuits invented the very word "Confucius," a Latinization of Kongfuzi ("Very Reverend Master Kong") -- itself an appellation not found in ru literature (which called the sage simply Kongzi, or "Master Kong"), although it is occasionally found on the "spirit tablets" honoring him in ru temples. Jensen does not believe that Kongzi even existed. "I think he's a literary trope," Jensen says. "He's a figure who came to stand for certain things." Jensen is currently researching the possibility that Kongzi -- whose birth, like that of Jesus, is the subject of many miraculous tales -- had his origins as a mythological figure of ancient Chinese fertility cults. On the surface, the theories of the Brookses and Jensen would seem contradictory, because the Brookses believe that Confucius was a real person who was born and died in the years ascribed to him. The two theories are, however, quite complementary, both contending that the Confucian tradition had no single founder but grew incrementally over many centuries, changing as cultural circumstances changed. For the Brookses, the powerful personality of a gentleman soldier lies at the bottom of the tradition, whereas Jensen sees that place occupied by a powerful mental construct. And both theories, though iconoclastic in many particulars, have some common ground with the work of other specialists. Most Sinologists these days would agree that Confucius, if he existed at all, has left little concrete evidence of what he was like, and that the traditional biographical material associated with him is largely legend. It is also accepted academic wisdom that the Analects was put together over several generations -- although few argue that it took quite the length of time the Brookses postulate. As early as the seventeenth century, for example, scholars in China began noticing that the second half of the Analects seemed stylistically and thematically different from the first half, probably reflecting influences other than Confucius' own. "We've known for a long time that some of the later parts of the book are suspect," John E. Wills Jr., a professor of Chinese history at the University of Southern California, says. "After Chapter Ten or Twelve you get a lot of fishy Taoist stuff in there." Last year the American Academy of Religion awarded Jensen's Manufacturing Confucianism its prize for the best first book in religious history. And the solid scholarship evident in the Brookses' The Original Analects (though not necessarily the book's conclusions) has been endorsed by two of America's leading experts on classical China, David S. Nivison, of Stanford, and Frederick W. Mote, of Princeton. John S. Major, a Sinologist who taught for many years at Dartmouth, explains that some of the evidence that the Analects was composed over a long time takes the form of changes over the centuries in Chinese characters used to denote grammatical markers -- but he takes issue with some of the Brookses' methodology. "[Bruce Brooks] likes to assign precise dates to the Analects' layers, and that's where I think he's stretching it," Major says. "He tends to assume that the evidence we have of a certain period is all the evidence there is. For example, there's a passage that refers to a battle, and we know that in this year there was this battle -- so as far as Brooks is concerned, the passage must have been written that year. But it might have referred to a different battle that we don't know about. He also removes passages that don't fit his theories." For instance, in reconstructing Chapter 4 of the Analects (the only chapter that the Brookses say contains Confucius' own words) the Brookses have moved more than a third of the text to another section, including sayings that extol filial piety, self-control, moderation, and other virtues they believe Confucius never espoused. They contend that these sayings do not match the other material in Chapter 4 thematically. Major rejects this reasoning, arguing that the Brookses simply lopped off those portions of the chapter that do not jibe with their picture of Confucius. Such issues are likely to spark intense debate in the profession for some time to come. , a contributing editor of is the author of (1998). The Atlantic Monthly; April 1999; Confucius and the Scholars; Volume 283, No. 4; pages 78 - 83.